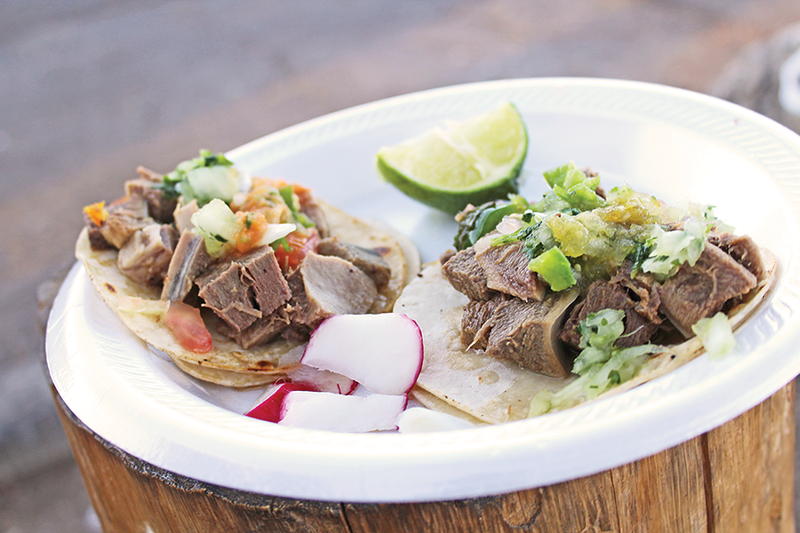 On the hunt for the city's best tacos de lengua. I've wandered among these rolling stands for the past few months, but I'm a traditionalist—I like to commit to a long-term relationship with my eateries. Sure, all of them make fantastic tacos al pastor, carnitas and carne asada. But a course of action didn't emerge until I wondered what a taco made with the most non-traditional ingredient (to the American palate) would taste like. I reasoned that the taco stand that treated beef tongue, tripe or headcheese with the most love would have to be someplace special. Tongue seemed like the most logical transition between regular street taco fare and a more culturally expansive menu, so that's where I started. Here, I tried my first taco de lengua (pictured), and the hardest part of taking my first bite was purely psychological. The meat looks just like cubed beef, but there are some distinctive bumps and ridges that subtly remind you that, yep, that's tongue you're eating. The key to this first experience was to overload the meat with as much complimentary pico, hot sauce and pickled radishes as possible. It did the trick—I was rocking this tongue taco. Flavor-wise, it's a lot like pot roast stuffed between two pleasantly greasy corn tortillas. After all, at the end of the day, a cow's tongue is a muscle just like its flank and sirloin. Texturally, it leans a bit too close to rubbery, but that wasn't as alarming as I had originally thought. Right off the bat, El Paisa gets bonus points for putting rice and pinto beans on their tacos, even though their prices are the same as their competitors. I was also surprised to see that the tongue here is slow-roasted. Once I added my condiments and squeezed the tortilla together, the meat just crumbled into velvety pieces. El Paisa's tacos tend to run on the salty side, and that was definitely present here. But there's something thoughtful about this tongue—it's marinated and roasted, which completely eliminates the rubbery texture I expected. I recommend asking for grilled onions on top of this one for a delightfully messy, beefy bite. By the time I rolled up to Don Rafa, I was feeling pretty damn proud of myself. Not only had I already eaten a few tongue tacos, but I actually liked them. I made my order with a bit of a wink, acting like I knew what I was doing. When they presented me with my third and final taco of the day, I was immediately taken aback. This looked like a tongue that was unceremoniously ripped from the mouth of a cow and hacked apart without thinking. My confidence level drained as I began prepping the taco for consumption. Again, the flavor was there—but this one had some interesting textural notes that eerily haunt me to this very day. Sure, the tongue here might be fattier, but the first two tacos outshined (and out-licked) Don Rafa. Up next on the trepidatious taco trek: tacos de tripa (beef tripe), cachete (cheek) and sesos (braiiins).